← How to convert an image of emf to ps file? An emf file is a Windows Enhanced MetaFile which is a revised version of WMF (Windows MetaFile) format. EMF has more commands than WMF. EMF format supports to store images in vector mode, which means the vector components will not lose their displaying quality while being zoomed in. The two snapshots below show the difference of two pictures stored in EMF and GIF format, respectively. In the upper one that shows an image stored in emf format, we can see that the text “VeryPDF” is clear and sharp though the size is enlarged. In the bottom picture, obviously the text is blurred and pixelated with losing much image quality. Another two snapshots show the emf file even has a better display quality than the one in gif when being presented in normal size. Here is a method of converting an image of emf to postscript format without losing its vector features and image quality. 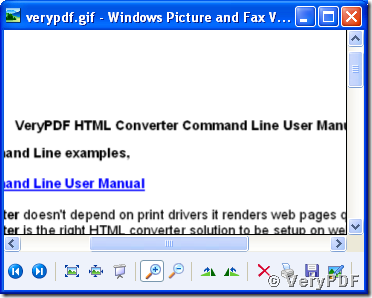 Install the VeryPDF HTML Converter Command Line and type these commands (below) into you MS-DOS command line prompt window, then you will get your image converted from emf to postscript, ps format. “D:\htmltools\htmltools.exe” calls the conversion tool, “D:\htmltools\verypdf.emf” specifies the path and name of the source emf file. 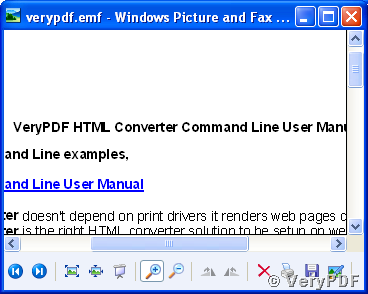 “D:\htmltools\verypdf.ps” with extension name “ps” is to tell the convertor to convert the image emf to postscript format. This entry was posted in HTML Converter (htmltools) and tagged emf conversion, emf to postscript, emf to ps, emf2ps, VeryPDF HTML Converter. Bookmark the permalink.